It’s been 3.5 years since we moved from the East Coast to sunny California! In that short time, we’ve been so fortunate to have visited so many of California’s great attractions and cities. Seriously, California truly has it all. Where else can you go soak up the rays on a beach, ski down powdery slopes, hike to through a breathtaking national park, and eat amazing food, all within a few hours of each other? I highly recommend a roadtrip through this great state! 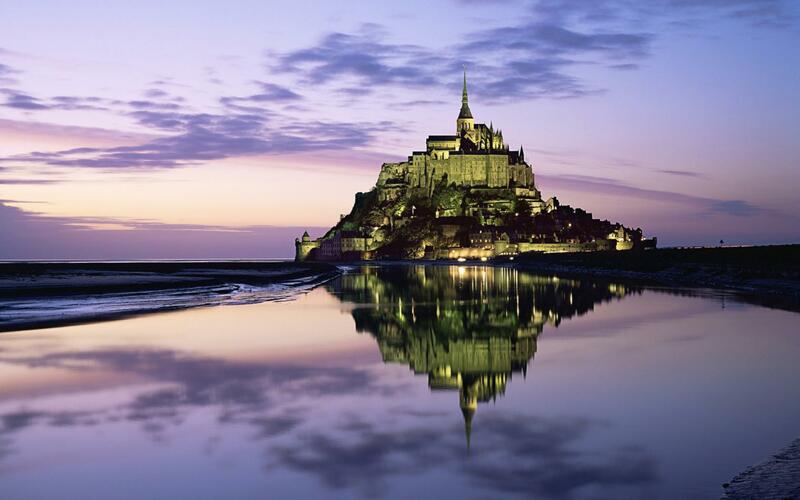 Here are the breathtaking sights and cities that we’ve visited. Los Angeles – Where to begin? Santa Monica beach and boardwalk, Hollywood hike, Venice Canals, and food trucks! Stay tuned for future posts on La La land! Joshua Tree National Park – Love those Joshua Trees! San Francisco – I love this city! SF is a charming city with amazing views throughout and an overabundance of great food! 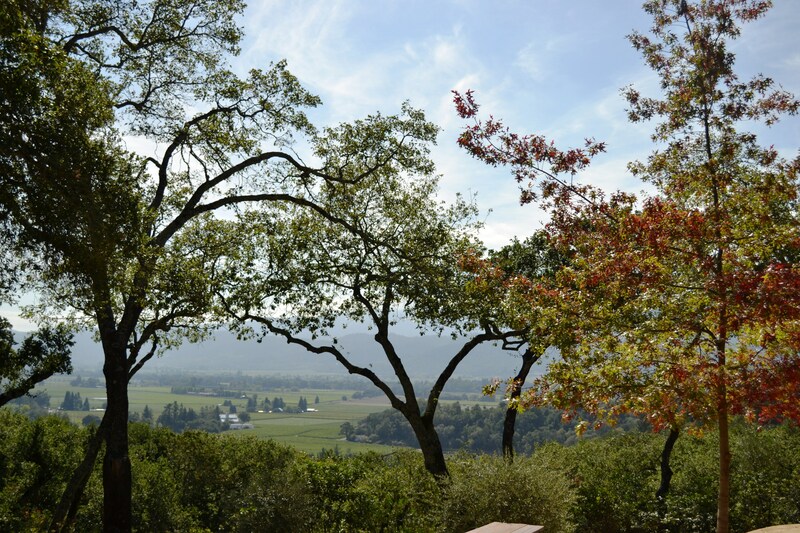 Napa Valley – Delicious wine and food, and gorgeous scenery to boot…. what else do you need? Yosemite National Park – One of country’s most beautiful national parks, Yosemite has breathtaking scenery and if you visit from May through September, gushing waterfalls! 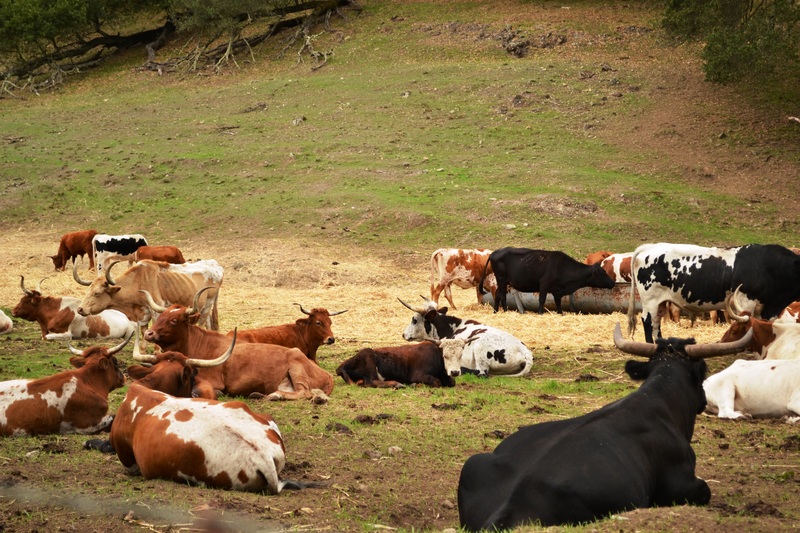 Mendocino – Rugged coastlines and a slower pace of life, this is the perfect area for rest and relaxation! 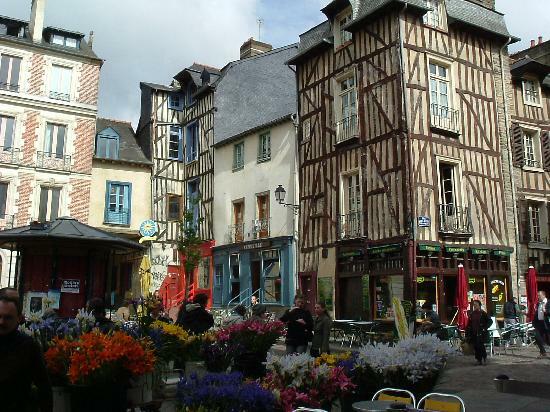 And 2 places I haven’t visited yet, but will eventually! We’re back to our regularly schedule Friday date night! And what a night it was! I had been wanting to go to Frances forever and finally got my chance. The restaurant is so popular I had to book the reservation a month in advance and even then could only get a 9:30pm table. But it was worth it! Even though Frances is a one-michelin starred restaurant, the price range is still reasonable and the atmosphere is casual and unpretentious. The restaurant is small and you end up sitting really close to the other customers so this is not the place if you want some privacy. The service however is great. We arrived at the restaurant 20 minutes early and they seated us right away. The host was really friendly and attentive, as was our waiter, who even made a point to tell us not to feel pressured to drink all of the wine. Frances sells their own blend of house red and white wine, which they sell at a $1 an ounce. They bring out a carafe of it and you only pay what you pour. Even without the waiter’s urging though, the hubs and I found ourselves finishing it, $16 for 4 small glasses of wine, not too shabby. To start, we ordered two bouchees (bites in French), the applewood smoked bacon beignets and the grilled local calamari. The beignets were wonderful. It was savory with a very strong bacon flavor and served with creme fraiche and chives. The calamari dish was a good balance to the beignet. It was grilled perfectly and tasted really fresh. The hubs ordered the five dot ranch bavette steak and I had the caramelized atlantic scallops. The hubs thought the steak was cooked perfectly (medium rare) and extremely tasty. The scallops were also delicious. My only gripe with the dish was that there were only two, albeit very large, scallops. The portions are on the smaller side but you’ll be fine if you also order an appetizer. Or you can request bread, as I did. Frances doesn’t automatically bring bread to the table as most restaurants do, but they do have it available if you ask for it, and you should since it’s Acme bread! To cap off the evening, we ordered the brown butter ‘friand’ cake with roasted warren pears, huckleberries, and creme fraiche. A friand is similar to a financier, a small french teacake, which actually reminded me of a madeleine. It was delicious! As an example of how good their service is, the table next to hours ordered the friand cake before us but the waiter mistakenly served it to us first (oops) so the restaurant gave them a small plate of chocolates and an extra dessert! Man, I wish they mistakenly give our dessert away! Frances is a MUST try, but just make sure you make a reservation in advance, it’s popular! 3870 17th Street, between Pond and Noe St.
Last Friday, the hubs and I took advantage of Outback’s free steak dinner promo. While Outback certainly is delicious and can make a great date night (I love me some bloomin’ onions and wings), it’s a popular chain so I’m sure most of you guys don’t need me to tell you about the food. Not to fret though, I had the pleasure of trying the famous Hog Island Oyster Company for lunch the following day so I’ll tell you about that experience! Those of you who have visited or live in the San Francisco Bay Area know that going to the Ferry Building Farmers’ Market on Saturday is a must for any food lover. And it’s even better when it’s a gorgeous day. But of course that also means that there’ll be tons of other people there so be prepared to wait! My friends and I ended up waiting close to 1 hour, but we were able to snag an outdoor table with views of the Bay Bridge so it was all worth it. Since there was 4 of us, we decided to split the Oyster Bar Mix. Our server made sure we had 4 of each kind of oysters for a total of 2 dozen so we’d all be able to try everything. The oysters were a-mazing! Each one was so tasty and refreshing. The highlight for the whole table was the New Zealand oysters (sorry, I can’t remember the exact name). My friend is from New Zealand, which is known for some of the best oysters in the world, and even he thought it was especially good! We also ordered the grilled cheese sandwich, the clam chowder, and a light mixed greens salad. I didn’t try the grilled cheese but my friend, who loves cheese, said that it was really delicious. The clam chowder was also tasty. 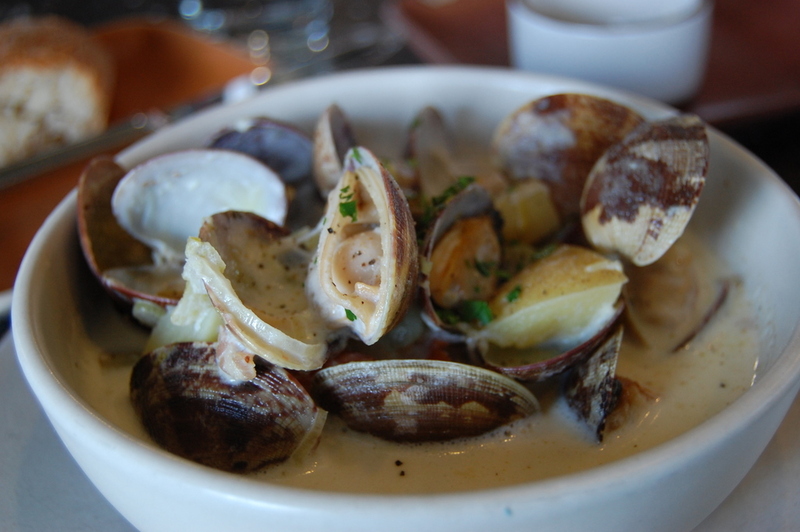 It’s thinner than what you’d typically expect of New England clam chowders, but it did have an abundance of fresh clams (with the shell and everything!). Needless to say I would highly recommend Hog Island to anyone who’s an oyster enthusiast. If you ever get the chance though, visit their oyster farm up in Tomales Bay (about an hour and a half north of SF) for a true farm-to-table experience. 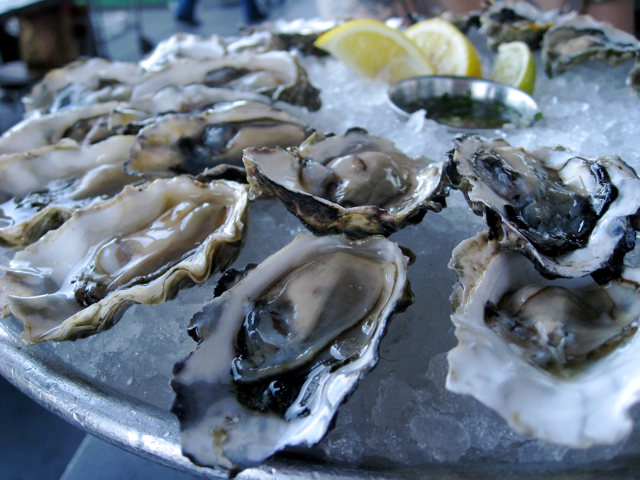 You can buy fresh oysters to go, shuck them on-site at their picnic grounds, or have a meal at The Boat, which offers various shellfish, cheeses from Cowgirl Creamery, and charcuterie from Fatted Calf, all good stuff! I hope everyone is enjoying their extra hour of sleep, drinking, tv-watching, whatever, tonight! I know I’m a bit late with this post, but better late than never right? So a few weeks ago, my friend and I trekked up to Napa Valley for a biking tour. I was a bit apprehensive at first, mainly because of 1) the early meeting time and 2) drinking and riding sounded like it could be hazardous. But I’m so glad I did it! 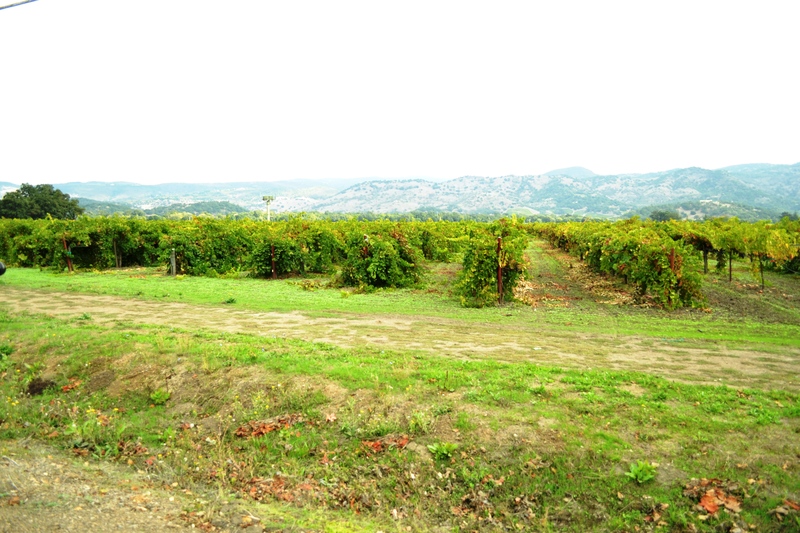 It was such a great experience and it really gave me the chance to appreciate the beautiful scenery between wineries. 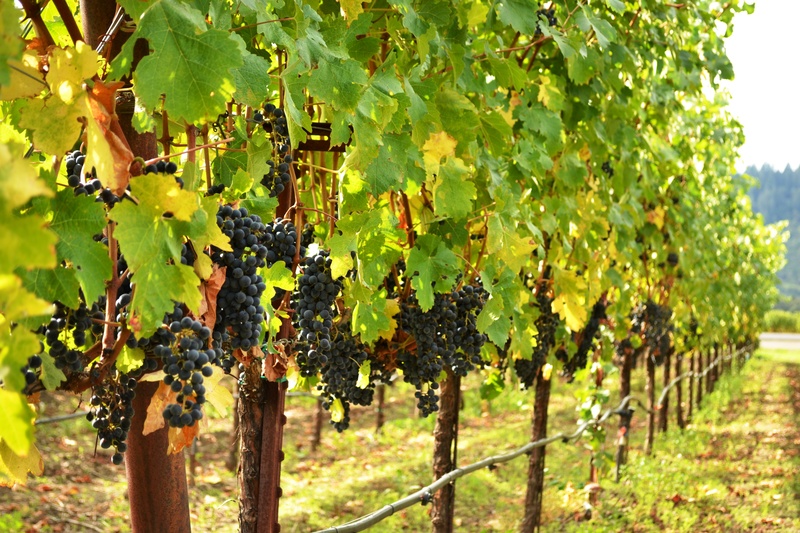 There’s a number of bike tour companies in Napa Valley, but we ended up selecting the explicitly named Napa Valley Bike Tours since they offered half day tours as well as full day ones. We liked that we’d be able to visit 2-3 wineries with the tour and finish in time to have lunch wherever we wanted. Also, the half day tour allowed us usage of the bikes for the rest of the day so we were able to visit more wineries at our own pace as long as we returned the bikes by 5:30 in the evening. I would highly recommend this option since you have more flexibility while still getting some of the tour benefits. We started the tour in Yountville, which is a really charming town (check out my travel inspiration post!). I grabbed some coffee and a few muffins from the Yountville Coffee Caboose, about half a mile down from the bike shop, for breakfast and snacking throughout the day (I highly recommend the morning glory muffin! ), although that proved unnecessary since the tour provided energy bars. 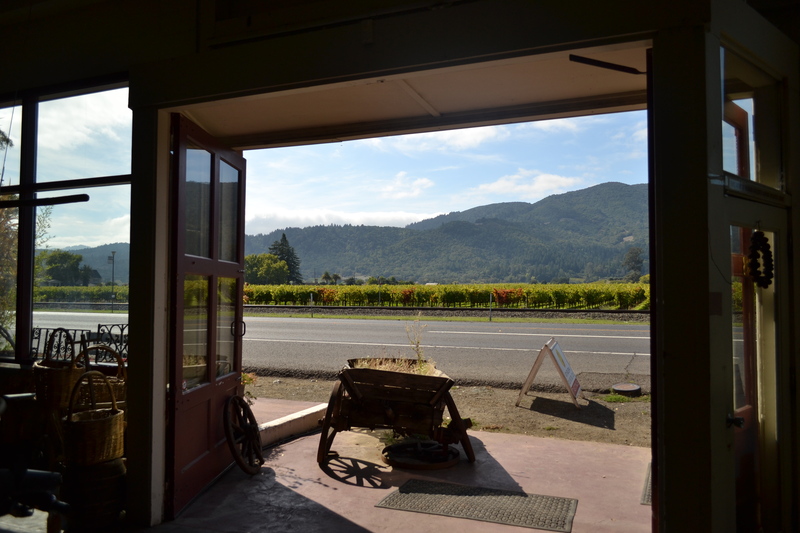 The first stop was to the spot of the first winery in Napa where our guide, a highly energetic 60 year old lady, gave us the history of California and Napa Valley. It was interesting and informational, but for those of you who aren’t interested in that kind of stuff or have a short attention span, you can amuse yourself with the cow pasture across the way, as I did. Afterwards we visited Sawyer Cellars, a small family owned winery that has tastings by appointment only. One of the benefits of the tour is that the guides really know the area and they are able to recommend the less touristy wineries. We then headed to St. Helena Olive Oil Company, which is a really cute store full of different kinds of olive oil, balsamic vinegar, salt, pasta sauce, mustard, and more, all of which you can taste with bits of bread. And boy did I try them all! I really fell in love with the truffle olive oil but at $45 a bottle, I really couldn’t justify buying it then, but maybe I’ll take the dive and buy it the next time I visit. Finally, after what seemed like a long bike ride, we visited our last winery, Rutherford Hill Winery, which as you can guess by the name, is on a hill. So while it made for great views, it was quite an effort reaching it. After that, my friend and I returned back to Yountville on our own since the rest of the people on the tour paid for the full day. Overall we really enjoyed the tour, however I do wish it had been better organized. Since my friend and I were the only ones on the half day tour, we were placed with the full day tour and was expected to leave after lunch. The full day tour group is of course able to take things more leisurely so I felt like we were shortchanged since we only visited two wineries which went about an hour and a half over the estimated time. If the tour had been organized specifically for the half day, we probably would’ve finished on time or been able to squeeze in a 3rd winery. The only other thing I feel I should mention is that while the website lists the bike tour as easy and on flat to rolling roads, I would say it’s moderate with some uphill roads. I’m pretty fit, yet I found myself exerting quite a bit of energy on the trail. Nonetheless, I would still recommend this activity. 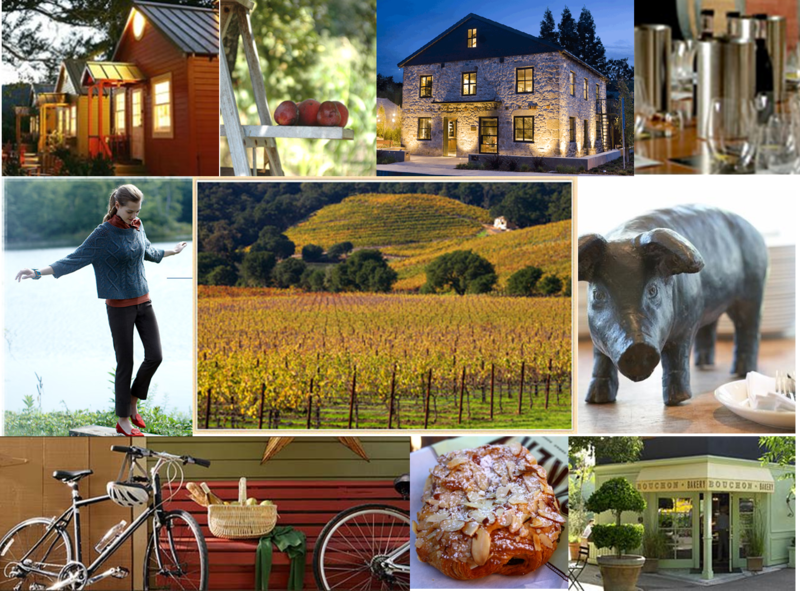 This week’s travel idea was inspired by my recent bike riding trip in Napa Valley (post coming!). It was my first time in Yountville and it was so quaint that I immediately decided that I had to plan an ideal weekend getaway for me and the hubs sometime in the near future. While we are by no means oenophiles, we do enjoy drinking wine and eating delicious food, making Yountville the perfect town, since it is home to Thomas Keller’s famed restaurants and numerous tasting rooms. Stay at the charming Cottages of Napa Valley, which in addition to being pet friendly also has the added perk of providing a daily breakfast basket of pastries from Bouchon Bakery. What better way to start the day then with a chocolate almond croissant in bed? 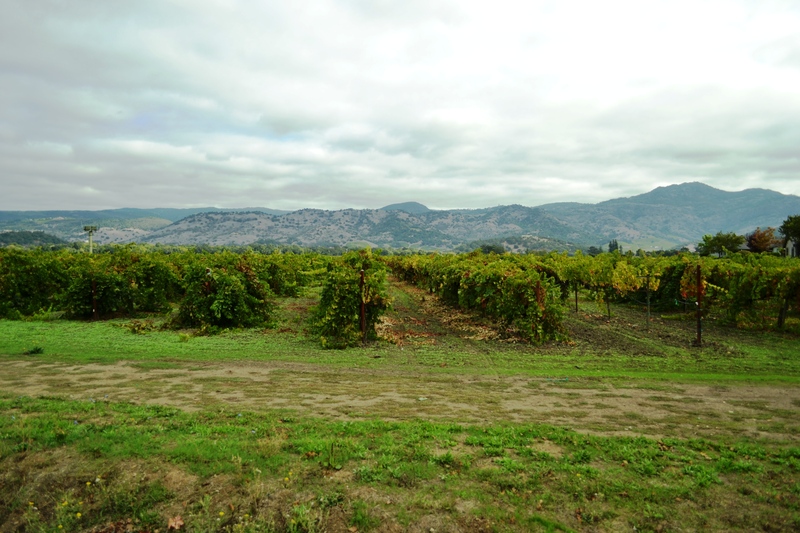 Afterwards,walk through town taking in the shops, chic tasting rooms, and gourmet restaurants and head to the Hill Family Farm and Jacobsen Orchards for the Secret Garden Tour. The Jacobsen Orchards is the organic farm contracted to French Laundry, so even if you can’t get a reservation or afford to eat at the restaurant, you can still tour their garden and sample the fruits and vegetables. Another slightly off the beaten path activity is the wine making experience at Paraduxx where you can mix your very own blend. 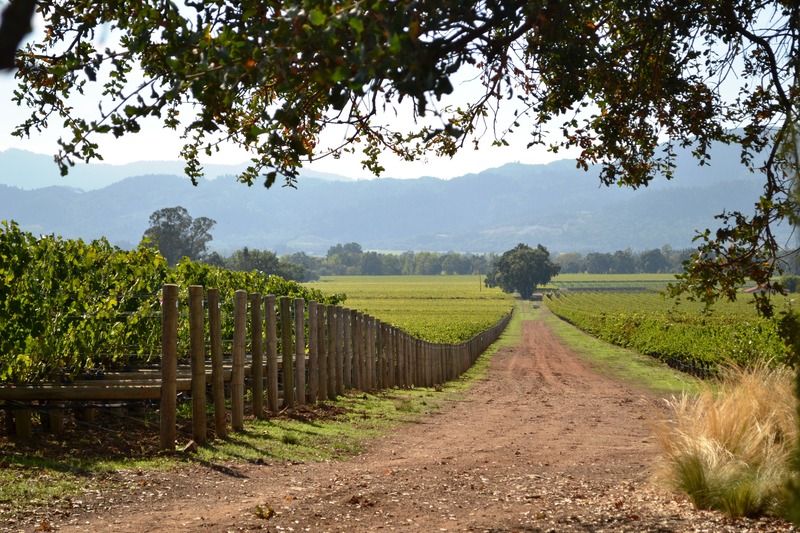 Spend the rest of the weekend biking through the beautiful rolling hills of Napa Valley and stopping by the numerous intimate family owned wineries. After you’ve had your fill of wine, head to Ma(i)sonry to peruse the art gallery or St. Helena Olive Oil Co. to sample numerous varieties of olive oils, mustards, salts, and sauces. Round out your weekend with a visit to any number of notable restaurants in Yountville, like Thomas Keller’s casual family style restaurant Ad Hoc, the landmark farm-to-table restaurant Mustard Grill, or the Michelin starred yet unpretentious Redd. Fall is finally here! I’m so excited! I spent the last two years in the land of perpetual summer and I’m happy that I finally get to experience a change of seasons. Is there anything better than drinking warm apple cider, breathing in the crisp air, and watching the leaves change colors? I think not. 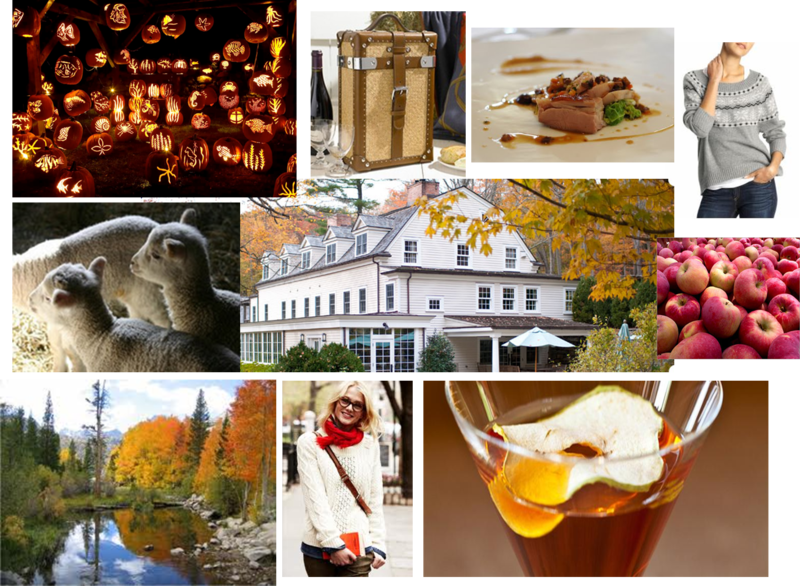 Hudson Valley would make a lovely weekend getaway for those living in the NYC metropolitan area. Stay at the intimate yet luxurious Bedford Post Inn, which includes a complimentary yoga class and daily homemade pastries for breakfast. After a peaceful night’s sleep, spend the next two days hiking and taking in the wonderful fall foliage,visiting a working farm, or apple-picking. Squeeze in a picnic and a glass of wine or two. Savor the seasonal ingredients at Blue Hill at Stone Barns for dinner. Finally, get in the Halloween spirit with a good scare at The Great Jack O’Lantern Blaze.